Lung Cancer: One Year on CA Care Therapy: Thank you for taking care of me! SHK is a 84-year-old lady. She came to see us on 21 April 2013 – shook my hand, over and over again and said Thank you, thank you for taking care of me. I am doing fine. We were glad to see her looking so good. SHK said she did not cough with blood anymore. Her long-standing (10 years plus) pain in the jaw had also improved. Everyone was happy! I repeatedly asked SHK if indeed she was feeling well. She responded repeatedly that she was indeed well – no more problems! 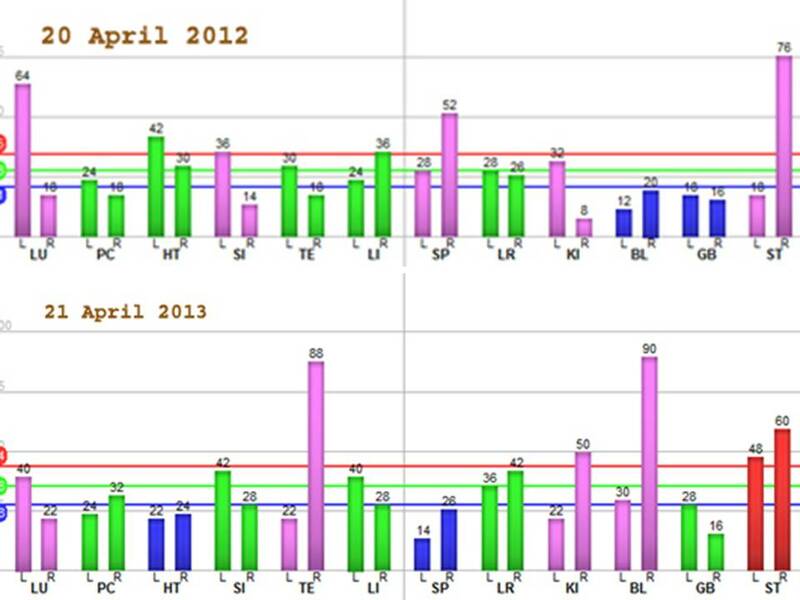 Below is a comparison of her digital meridian imaging done on 20 April 2012 (top) and 21 April 2013 (bottom). Suffice to say that her health had not deteriorated over the year, and being well and feeling well is not an imagination of her own mind! And that is all that matters! SHK’s problem started in September 2011. She had coughs, producing phlegm with blood. An X-ray on 3 September 2011 indicated a large, fairly well-defined oval opacity, 3 x 4 cm, seen in the right mid-zone. A small central calcification is seen in the opacity. Appearances are in keeping with a pulmonary tumour. SHK had been smoking for 50 to 60 years. She had since stopped the habit. Based on the above, the doctor in a private clinic suggested that SHK undergo radiotherapy. Not satisfied, SHK consulted a lung specialist of a private hospital in Penang. 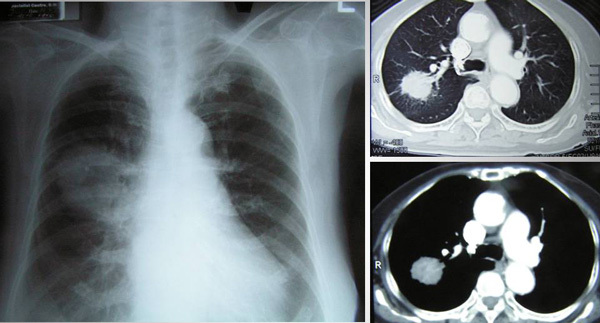 A CT scan on 5 September 2011 indicated a mass in right upper lobe, consistent with bronchogenic carcinoma (T2NoMo). The mass measured approximately 4 x 3.5 cm in diameter. Dot calcification noted within the mass. It is completely surrounded by lung parenchyma. The rest of the lungs are clear. Undergo surgery to remove the tumour. According to the lung specialist, surgery can cure her cancer, but because of her advanced age, she might just die with the surgery. 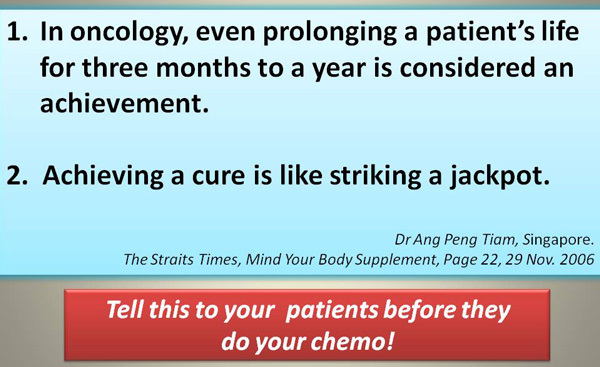 Undergo chemotherapy. Because of her age, she might just die with the treatment. A biopsy needs to be performed to determine the type of cancer she has. However, the risk is high. There is a 99% chance that she would end up with difficulties. There is only a 1% chance that she will be okay. The patient’s daughter said, I went dizzy with such suggestions and did not know what to do. The doctor asked me to sign the consent form if we agree to go ahead with the biopsy. SHK and her family declined further medical treatment. A repeat X-ray was done on 12 April 2012 and the result showed the mass in the RMZ has increased further in size and now measures 5.5 cm. It is fairly well-defined with lobulated margins and extending to the right hilum. It has a central lucency. Appearances are in keeping with a bronchogenic carcinoma. The rest of the lungs are clear. Since the tumour had grown bigger, the family decided to do something and came to seek our help on 20 April 2012. There was a bit of pain in her chest. Stomach wind for the past 30 to 40 years. Pain at the back shoulder. Pain in the jaw for the past 10 years. If she coughed, there was a bit of blood in the sputum. When I first met SHK I said to her, Auntie I am glad that you are already 83 years old. If I can live to your age, I would be most grateful indeed. Then her daughter related the mother’s problems and their encounter with a lung specialist of a private hospital. What to do with the 4 x 3.5 cm tumour in her lung? Let me ask you. If she was your mother, what would you do? Some may say, go all out to get rid of the tumour. Spend and give her the best that medical technology can buy. On the other extreme, some children of patients would say that since my mother is already old, let’s do nothing. Go for quality of life. It is not for me to decide what you should do with your mother! You have to make that decision. Let’s turn to what the doctor said. It is indeed mind boggling. Three possible options were laid out. Go for surgery which she could face the risk of dying from the procedure! Go for chemo and the treatment would probably kill her! But before considering these, it would be good that a biopsy is done to determine what type of lung cancer she has! But even doing a biopsy would put her at risk. She was told there is a 99% chance that she will suffer from the procedure! Can you decipher the logic of such medical advice? Why do you want to do the biopsy when you can’t offer any chance of treatment let alone cure? I told the family. I am glad that you did not agree to the biopsy! It is human nature that once told that we got cancer we go into a frenzy – madly rushing here and there believing that we must get things done quickly. There is no need to behave like that. I always tell patients: Don’t panic. There is no need to rush. You did not get cancer yesterday. The cancer has been with you for years already – only that you don’t know that it was there. So take it easy and calm down. At CA Care we ask you to relax and reflect to understand what has gone wrong. Then we sit down with you to plot your cancer journey using as much common sense as possible. Many of you may not like to learn this. For certain cases and under certain situations perhaps doing nothing is more logical and humane. Doing nothing is not about you going home and sitting under a coconut tree waiting to die. It is not about doing NOTHING to help yourself. When you come to CA Care we teach you to live a happy life taking care of yourself – take care of your diet, change your life style and mental attitude, take herbs and seek blessings from Above. All these, somehow, could probably make your remaining time on earth more meaningful. And by doing these you may probably live longer than your doctor’s prognosis. Recently, Malaysia’s most well-known oncologist, Dr. Albert Lim was diagnosed with prostate cancer. He died within a year. Going by the Singapore’s well-known oncologist’s yardstick, surviving a year was an achievement. In this case, SHK was diagnosed with lung cancer – probably more lethal than prostate cancer. She was coughing blood. She did not go for chemotherapy or surgery. She took herbs. And after one year she remained very healthy. Is this not also an achievement? Acknowledgement: We record our sincere thanks to Dr. Adrian Larsen, President of Miridia Technology Inc., USA, for his generosity in providing a unit of AcuGraph 3 for our research at CA Care. The use of AcuGraph for our patients is free-on-charge. This entry was posted in Lung Cancer and tagged CA Care Therapy, herbs, lung cancer by CA Care. Bookmark the permalink. Stop the Cancer Drug Ripoff! Colon-Liver Cancer: After surgery, he opted for CA Care Therapy. Right? Wrong? Living with Multiple Myeloma. Herbs helped her.